Nana Akufo-Addo has once again appealed to Ghanaians to give him the mandate to rule Ghana come November 7, 2016 when the West African nation goes to the polls. The New Patriotic Party flagbearer who is eyeing the presidency for the third time, having lost the two previous general elections, said he will “not disappoint” Ghanaians once they vote him into power ahead of incumbent John Dramani Mahama of the National Democratic Congress. 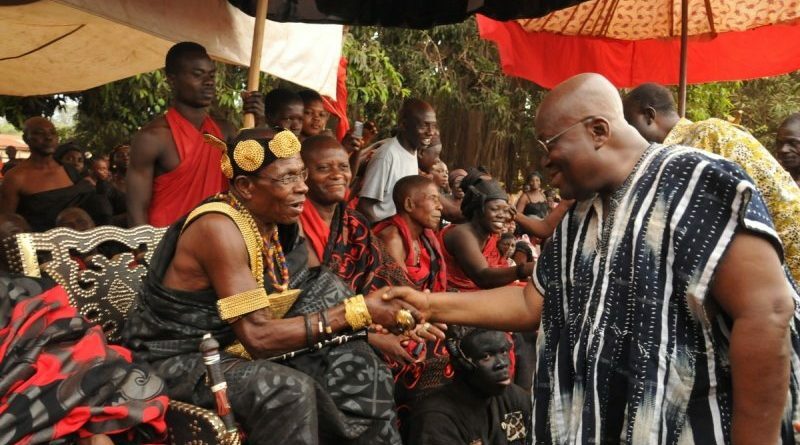 The 2016 presidential candidate of the NPP made the appeal when he joined the chiefs and people of Suma Ahenkro, in the Jaman North constituency of the Brong Ahafo region, to celebrate the Akwantu Kese festival. “I’ve come to appeal to you to trust and have confidence in me. The change we seek to bring is a change that will affect positively all parts of the country without discrimination. Suma Ahenkro is going to benefit strongly from an Akufo-Addo government. I assure you that I will not disappoint you. The trust you put in me, I will not disappoint you,” the former minister and lawmaker assured. 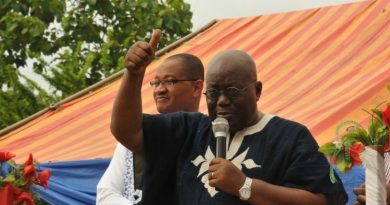 Nana Akufo-Addo, who was the special guest of honour at the Adinkra durbar, the first of its kind which commemorates the Adinkra symbol, was accompanied by national and regional party stalwarts, including the National Women’s Organiser of the NPP, Otiko Afisa Djaba; former presidential aspirant and former Minister of Trade, Industry and PSIs, Alan Kwadwo Kyerematen; and NPP Brong Ahafo Regional Chairman, Kwaku Asomah-Cheremeh. The colourful durbar was also attended by Nana Kwasi Adinkra Agyemang, the Gyamanhene, who resides in the Republic of Cote D’Ivoire, as well as eminent traditional rulers in Ghana and Cote d’Ivoire. In his brief remarks to the gathering, Odeneho Dr. Afram Brempong III, the paramount chief of the Suma Traditional Area, thanked the NPP flagbearer for gracing the durbar, held to commemorate the journey, centuries ago, by the people of Suma from Akwamu to their current settlement. With barely eight months to the conduct of the general elections, Odeneho Dr. Afram Brempong III called for peaceful polls, and a level playing field for all political parties so the outcome of the election will be readily accepted by all. He also appealed to the NPP flagbearer, should he be elected President in this year’s election, to help establish an International Adinkra Village in Suma Ahenkro to boost tourism, and also set up a satellite campus of the University of Energy and Natural Resources in Suma Ahenkro. Nana Akufo-Addo, who addressed the gathering in impeccable French, for the benefit of the Ivorian participants, and in Twi, thanked the organisers of the festival for the honour done him by the invitation. He assured the chief that the NPP, as a peaceful party with a proven track record, will continue to act for peace in the conduct of the elections. 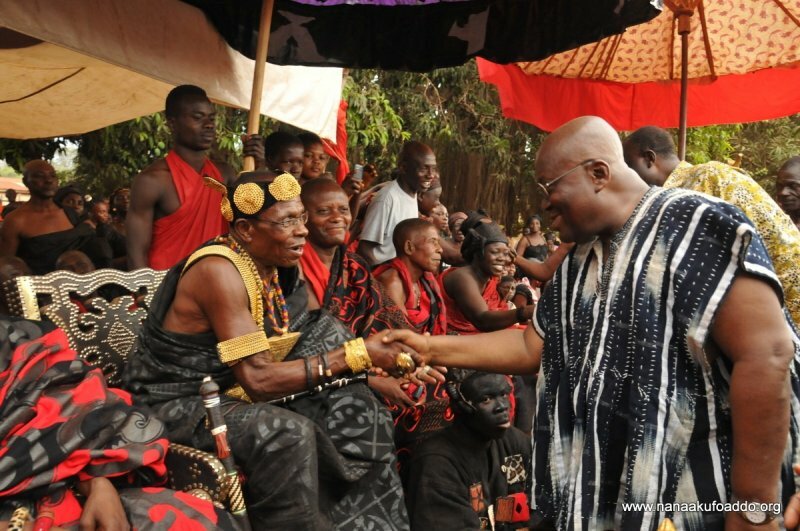 He assured the paramount chief and the people of Suma Ahenkro that the requests put forward by the Chief will be given serious consideration since they were progressive ideas, should the people of Ghana entrust the mantle of leadership in his hands in this year’s elections. Nana Akufo-Addo reiterated his commitment of transforming cashew into a major cash crop and foreign exchange earner for the country, through, amongst others, the establishment of a Cashew Marketing Board to look after the welfare of cashew farmers in the country. Nana Akufo-Addo was also accompanied by the Member of Parliament for Jaman North, Hon. Siaka Stevens; former NPP Brong Ahafo Regional Chairman, Kojo Yeboah Fordjuor; NPP Brong Ahafo Regional Secretary, Alfred Anye; NPP Brong Ahafo Regional Organiser, Rasheed Kolambig; NPP Brong Ahafo Regional Youth Organiser, Kwame Baffoe; NPP Brong Ahafo Regional Nasara Coordinator, Alhaji Ahmed Ibrahim; NPP Parliamentary Candidate for Tain, Gabriel Osei; NPP Constituency Chairman for Jaman North, Andani Nii Ankomah; amongst others.